Chen Hsi-Huang is the only glove puppeteer in Taiwan to have been recognized by the Ministry of Culture as an important preserver of both traditional glove puppetry (2009) and classical glove puppet clothing and headwear props (2011). Born into a puppetry family, from an early age Chen received strict training from his father Li Tian-Lu but as he got older, he ran away from home to escape the stressful training regime. This ultimately led him to develop uniquely different puppetry skills from his father. When he returned to his hometown, he inherited his father’s Yi Wan Jan Puppet Theater and also established the New Wan Jan Puppet Theater, which continued for the next few decades. At the age of seventy-nine, he became concerned that this elegant traditional art was disappearing so he decided to establish the Chen Hsi-Huang Traditional Puppet Troupe. Through performances in schools and educational projects, he hopes to pass Taiwanese puppetry on to future generations. Chen has always treated puppets as real human beings. He never says “operating” or “playing” the puppets; they must be treated with respect, as “Gods” even. He believes each puppet has their soul and their own distinct personality, movements, and words. A disciple of his once observed that as long as one worked hard to learn, Chen would spare no efforts to teach him or her. Chen also said that he would never retire untill he has imparted all his knowledge and skills. He himself is a lifelong learner, continuously preserving and innovating this tradition. Chen has innovated the production and performing of puppetry. He has staged several famous plays. For example, Marco Polo in 2006 was was a joint venture with the Taiyuan Asian Puppet Theatre Museum. The Second Goodbye in 2007 was a traditional story that involved newlyfound artistic talent from all over the world. Chen said, “I waived straggle parts and added some good stuff to make it more attractive.” In order to get more people to experience the joys of puppetry, he is willing to try anything. When it comes to the actual craft of puppet making, this nationally treasured master artist also has many innovations. He has developed exquisite and durable puppets that are easily to operate, which many puppeteers are eager to collect. 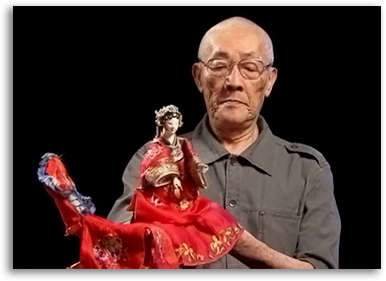 His unique skills have attracted people from as far away as Europe to learn from this great master of Taiwanese puppetry. Chen Hsi-Huang Traditional Puppet Troupe was founded in 2009. 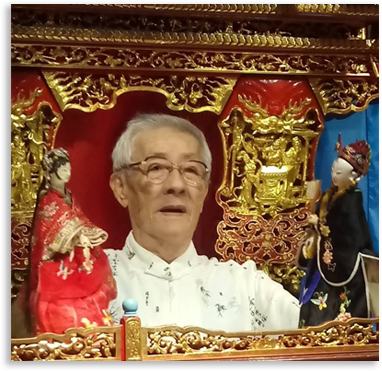 The founder, Chen Hsi-Huang, who has established Hsin-Wan-Jan Puppet Theatre Troupe in 1953 and I-Li-Hsuan Art Institute in 1984, wanted to preserve and pass on traditional puppetry skills by setting up a puppet troupe. In addition to Chen himself, the teachers at Chen Hsi-Huang Traditional Puppet Troupe also include Wu Rong-Chang, Huang Wu-Shan and Lin Ming-Wen. In 2011, Chen Hsi-Huang became the resident puppet master at Puppetry Art Center of Taipei, giving performances while also conducting student recruitment and puppetry courses. For example, the master workshop includes courses on craft production, background music production, puppet operation, props production, etc. In order to promote puppetry to the younger generations, Chen Hsi-Huang Traditional Puppet Troupe actively collaborates with other modern troupes to present innovative and experimental puppetry plays, performing often in school campuses. Throughout these years, it has staged numerous plays; some popular ones include The Legend of Nian Geng-Yao, The Neon Pass, and Uproar in heaven. Though A Chance Encounter Leads to Marriage is a simple story about how a hero came to a beauty’s rescue which leads to the two getting married, it actually has three classic roles in puppetry: little shen (young male character), little dan (young female character), and little chou (comic character). Chen Hsi-Huang revised the long story and changed it into a 15-minute mime version with only music but no dialogue so that foreigners can understand the story. In this play, the audience can see how puppeteers create exquisite, elegant movements and even do challenging juggling with puppets in their hands. A Chance Encounter Leads to Marriage surely presents the audience with all the amazing essences of puppetry.